President’s Day is a great time to learn about our forefathers of the United States. This craft not only teaches about how the former Presidents lived, kids can snack on the building materials, too! Close milk carton top and tape shut. Cover the top of the milk carton with peanut butter or Nutella. Place pretzel sticks into the peanut butter. Repeat this process all over the milk carton. 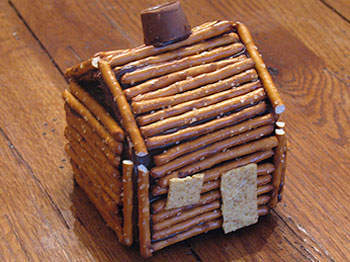 Use peanut butter to add cracker door and window and a Rolo for the chimney.